Once God Indra was flying a plane above the kingdom of king Shursen. One sinner saw Indra's plane and with his ill- look the plane landed down.Kng Shursen was pleased to see God Indra and saluted him. Indra told him about the sinner's ill-look and the plane's landing. Indra said,that today is Paush-Panchami and yesterday was the Chaturthi.If anyone fasted yesterday and gives his virtue to me then my plane will start. Soldiers searched the city but unfortunately they found no one. At the same time some soldiers saw Ganesh-Doot taking away a woman who died recently. When soldiers asked ,he told them that yesterday whole day that woman was asleep and did not eat anything. After moon-rise she woke up and ate some food. Without her knowledge Sankashti-Chaturthi was observed by her and she died today. A person who does Sankashti-Chaturthi goes to Ganesh-loka. Soldiers requested Ganesh-Doot to give that woman to them to help Indra. But he refused to do so. The wind which flown from the dead woman's body went till God Indra's plane and it started. It means that the wind which touched that virtuous body also become virtuous. 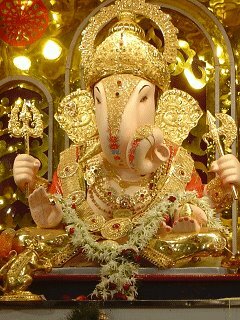 The person who observes Sankath-Chaturthi (fasting till the moonrise and then eat food) will collect lot of virtues.That person goes to Ganesh-lok after the death.